From "How to Write a News Article: The Intro or Lede"by St. Petersburg College Communications dept. "A California mother is recovering from second- and third-degree burns after colored rocks her family collected from beach unexpectedly caught fire while in her pocket." "The suspension of US sanctions in Myanmar in response to political reforms gives a green light to US firms looking for business opportunities." "World leaders say they are committed to soothing financial markets to prevent an economic calamity." "Eight California high-schoolers with the same last name pull off a witty stunt." "A broken-down cargo ship drifts towards the fringes of Australia's Great Barrier Reef amid fears of major damage to the World Heritage-listed site." Do you stumble over words? Does it sound like something you would tell a friend? Eliminate any words you trip over or that are confusing. See how many words you can eliminate. Have you put in description that could come later in the article? Have you added details that slow down readers' scanning? Have you used only words that will catch a reader's attention? Especially look for passive verbs - is playing should be plays. Have you spelled names correctly? Did you give the right locations, times, and dates? Is what you said what you meant to say? Is what you said what actually happened? Clichés are overused expressions that have stopped being original. Think carefully about whether you're using phrases or words that you hear everyday, even popular ones, and work for something more original. 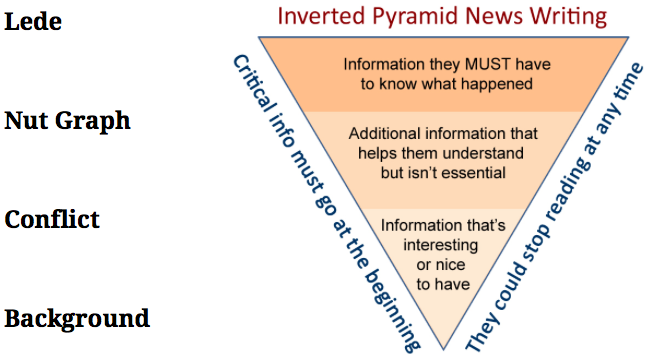 The rest of your story includes quotes, conflict and background, which are all crucial storytelling elements, but usually further down in the pyramid and less original.